DirectAccess Expired IP-HTTPS Certificate and Error 0x800b0101 | Richard M. Hicks Consulting, Inc. So, that should work great if using a certificate issued by a trusted CA (internal or external). I know some places have self-signed certs for DA, which are trusted by workstations via the DA GPOs assigned to them. In that case, if expired, they’ll be dead unless can get on the domain’s network for doing a GPUpdate or making them do a remote-join to the domain and sending them the necessary files. Correct? Not sure if there a more elegant method of handling self-signed cert expiration (before or after they expired), or if worth providing the feedback on the article, don’t want to detract from the good work you have done. Just thought I’d mention it for additional perspective. Thanks. Thanks for the great post(s) Richard. One question regarding Certificates issued by an internal PKI: Our internal IssuingCA expires soon and has to be renewed. When renewing, we would like to take the opportunity to upgrade it fom sha-1 signatures to sha-256. When we initially set-up DA in 2015 (on Windows Server 2012R2) we have been told that it does not support sha-256, but only sha-1. Can you confirm or bust this myth? I couldn’t find any information on thios topic yet. Thanks again! That’s definitely a myth. DirectAccess absolutely works certificates signed with SHA-2. If you are migrating from SHA-1 to SHA-2, the only change required on the DirectAccess server is to select the new root certificate. If it is the same CA or common name there is nothing else required. If you are also migrating to a new PKI hierarchy, the the change will be disruptive as remote DirectAccess clients will have to come back to the office or connect via VPN to update group policy. Is it a similar fix when the IPsec cert expires? Where is the IPsec cert set? We attempted to replace our public IPHTTPS cert recently due to the Google / Symantec falling-out. Windows 10 Clients were unaffected after the change but Windows 7 clients using the DCA refused to connect. We had to roll back given the reliance on DA so I was unable to troubleshoot properly. Would the new root and intermediate need to be present or will the client build the chain? Yes, the certificate chain must be complete on the DirectAccess server for Windows 7 clients to connect. In theory the client should be able to build the chain, but from experience I can tell you that it doesn’t. 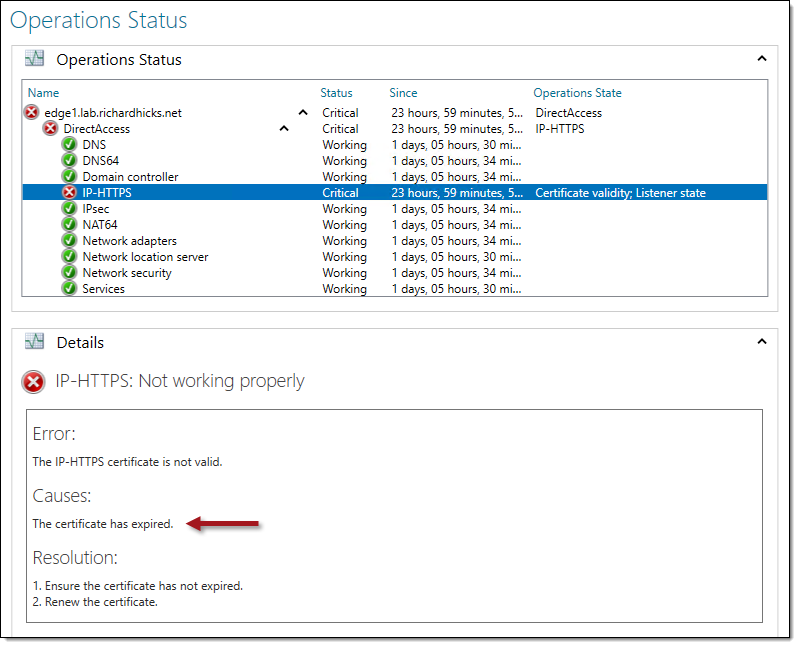 If you have any certificate chain issues at all the client will often show a “certificate not trusted” error on the IP-HTTPS listener. On renewing our IPHTTPS cert we’re now getting 0x800b0109. Running one online SSL cert checker, the results are that the DA server is not sending the intermediate cert, running another checker reports that the chain is fine. How can we confirm that the intermediate cert is installed correctly ? Odd that you’re getting different results from different tools. If you haven’t done so already, try using the Qualys SSL Labs server test site. If it indicates certificate chain issues, I’d expect it is right. You could also confirm this by taking a network trace and looking at the TLS handshake. Either way, if you suspect a chain issue the best thing to do is ensure you have all of the correct intermediate certificates installed on the DirectAccess server, and importantly they are installed in the correct stores. For example, you will have issues if the root and/or intermediate certificates are installed on the Personal store. Troubleshooting DirectAccess IP-HTTPS Error Code 0x800b0109 | Richard M. Hicks Consulting, Inc.
DirectAccess Get-NetIPHttpsState Fails on Windows 10 1803 | Richard M. Hicks Consulting, Inc.